Senator John McCain lost it on the floor of the Senate Wednesday and accused Senator Rand Paul of "working for Vladimir Putin." Paul opposed giving NATO membership to Montenegro, saying it would be "unwise to expand the monetary and military obligations of the United States given the burden of our $20 trillion debt." 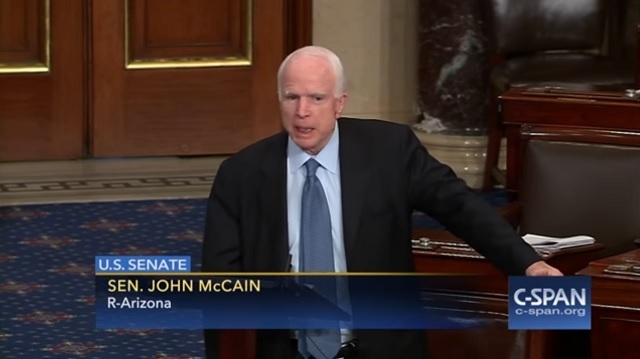 "If there is objection, you are achieving the objectives of Vladimir Putin," McCain said. "You are achieving the objectives of trying to dismember this small country that has already been the subject of an attempted coup." "That is really remarkable, that a senator blocking a treaty that is supported by the overwhelming number – perhaps 98, at least, of his colleagues – would come to the floor, and object, and walk away," McCain said. "He has no justification for his objection to having a small nation be part of NATO that is under assault from the Russians. So I repeat again, the senator from Kentucky is now working for Vladimir Putin."